DALIA is a lovely 5-year-old who is developmentally delayed. Her mother brought her to PROJIMO to see if anything could be done to help her "learn to walk and talk." On observing Dalia's responses to people and things around her, the PROJIMO team felt the child had a lot more potential than she had realized. She seemed quite alert - but her attention span was short. She would play with a toy for a moment, then drop it. She was beginning to speak a few words, but she had trouble pronouncing them. Physically, Dalia had difficulty with hand control and with balance. She had a lot of spasticity, mostly in her lower body. She could not stand, even with assistance. Dalia's mother explained that, as a single working mother, she often had little choice but to leave her daughter alone at home for long periods. For her safety, she locked Dalia in a small room. "I'd like to take her out with me and do more fun things with.her, like visit friends who have children," she said. "But she can t walk and she's getting heavy." Mari - a wheelchair rider herself - thought a wheelchair might help. She had Dalia try a variety of children's chairs at PROJIMO, to see if any suited her. One small second-hand wheelchair fit her well. Dalia loved it! She made a great effort to roll it by pushing on its wheels. Time and again, her mother said, "Use the hand rims!" But Dalia kept pushing the wheels. (They were easier to grip.) When at last she rolled the chair forward, everyone cheered. 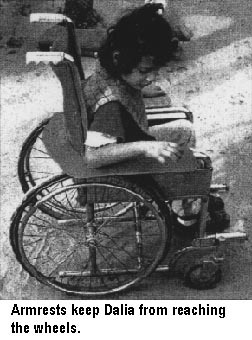 Here was a disability aid that held the child's attention, that helped to improve her hand control, that could stimulate interaction outside the home, and that gave her greater independence - all in a form she enjoyed and might well persist with. Dalia's mother foresees a danger. Dalia's mother recognized the benefits of the wheelchair. But she was worried. "I won't dare take her outside in it!" She explained that they lived in a slum on the edge of the city. The dirt alleys were full of garbage and "doo-doo." "You see, Dalia always puts her fingers in her mouth. Now that she's discovered she can move in her wheelchair, she'll always have her hands on its wheels! Filth from the street is sure to end up in her mouth and make her sick. Her health is already delicate." For this reason, Dalia's mother preferred to use a stroller from PROJIMO. It was rather like a baby buggy and, in it, Dalia would lie back passively, unable to reach the small wheels. Mari, a leader at PROJIMO, explained how important it was for Dalia's development that she sit upright, facing forward, to interact with her surroundings. She also explained that, as Dalia rose to the challenge of moving her chair independently, this would help her develop better hand and arm control and self-confidence, and it would open new social (and developmental) horizons for her. This might, in turn, help her improve her speech. But Dalia's mother stiil worried about the filth from the street. "I guess I just won't be able to take her outside in the wheelchair," she sighed, "unless there's some way to keep her hands off the wheels when we pass through filthy areas." Looking for a solution: The challenge for the PROJIMO team was to design some sort of "mud guard" to keep the child's hands from reaching the wheels of the wheelchair when passing through mud and filth. The mud guard needed to be simple, low cost, and light-weight. It also needed to be easy and quick to put on and remove. An innovative solution: A simple U-shaped armrest was cut from plywood. The two arm supports were wide enough to prevent the child from reaching around them to grasp the wheels. 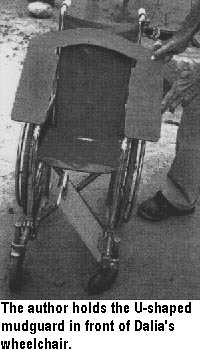 The back bridge of the "U" was curved to fit around the curved fabric back of the wheelchair. 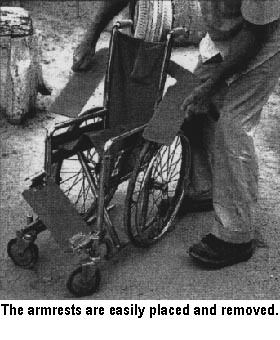 By folding the wheelchair slightly, the armrest could be instantly placed or removed. No clamps or ties were needed. The entire arm-rest took only half an hour to make (the time to cut out the design with a saber saw, to round the corners and edges, and to sand them). The only cost was that of a 50 cm square sheet of 1/4 inch plywood. The ease with which the mudguard can be put in place and removed makes it more likely that Dalia's mother will take it off when inside the house. It is important that the mudguard be removed when it is not needed, so that Dalia can increase her hand-skills and learn to move about independently in her wheelchair.